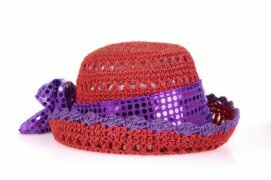 Think about a crochet sun hat pattern made up in red and purple. If you make it up in these colors for the red hat ladies you will have a hot selling item. Red and purple are the colors for these items and they sell very well. These fun ladies love their hats and are always on the look out for new ones. You can change a crochet pattern very easily. Crochet it up in red and add a purple sash. Or the opposite will work well also. You can add red and purple feathers for accent and they will love it. The Red Hat Society is everywhere and the items made up for these ladies are almost limitless. 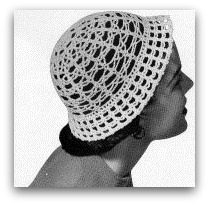 Find a crocheted hat pattern you like and make the brim smaller. Or use the wide brim; add a sash and pin up one side with a flower or feather. 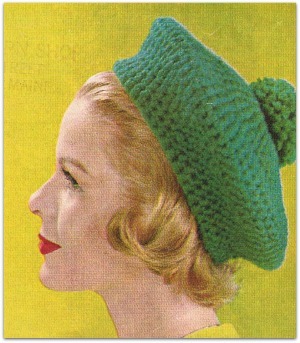 You can also make up a hat pattern and sell the pattern itself. Many of these ladies also crochet. Don't forget to make up some samples for an eye catching display. These ladies love red and purple, flowers and feathers. So keep this in mind when you make your special creation. Hat is worked with double strand of thread. Ch 5, d c in 5th st from hook, * ch 1, d c in same space, repeat from * 5 times, ch 1, join in 3rd st of ch. 2nd Round- Ch 3, d c in same space, * ch 2, 2 d c in next d c, repeat from * 6 times, ch 2, join in 3rd st of ch. 3rd Round- Ch 3, s c in next d c, * ch 3, s c in next d c, ch 3, s c in next d c, repeat from * 6 times, ch 3, join. 4th Round- Sl st into loop, ch 3, d c in same space, * ch 5, skip 1 loop, 2 d c in next loop, repeat from * all around, ch 5, join in 3rd st of ch. 5th Round- Ch 3, s c in next d c, * ch 3, s c in center st of next loop, ch 3, s c in next d c, ch 3, s c in next d c, repeat from * 6 times, ch 3, s c in center st of next loop, ch 3, join. 6th Round- Sl st into loop, ch 3, d c in same space, * ch 3, s c in next loop, ch 3, s c in next loop, ch 3, 2 d c in next loop, repeat from * 6 times, ch 3, s c in next loop, ch 3, sc in next loop, ch 3, join in 3rd st of ch. 7th Round- Ch 3, s c in next d c, * ch 5, skip I loop, 2 d c in next loop, ch 5, skip 1 loop, s c in next d c, ch 3, s c in next d c, repeat from * 6 times, ch 5, skip 1 loop, 2 d c in next loop, ch 5, join. 8th Round- Sl st into loop, ch 3, d c in same space, * ch 5, s c in next loop, ch 3, s c in next loop, ch 5, 2 d c in next loop, repeat from * 6 times, ch 5, s c in next loop, ch 3, 5 c in next loop, ch 5, join. 9th Round- Ch 3, s c in next d c, * ch 3, s c in next loop, ch 3, 2 d c in next loop, ch 3, s c in next loop, ch 3, s c in next d c, ch 3, s c in next d c, repeat from * 6 times, ch 3, s c in next loop, ch 3, 2 d c in next loop, ch 3, s c in next loop, ch 3, join. 10th Round- Sl st into loop, ch 3, d c in same space, ch 7, skip 2 loops, s c in next d c, ch 3, s c in next d c, ch 7, skip 2 loops, 2 d c in next loop, repeat from * 6 times, ch 7, skip 2 loops, s c in next d c, ch 3, s c in next d c, ch 7, join in 3rd st of ch. 11th Round- Ch 3,s c in next d c, * ch 4, s c in next loop, ch 4, 2 d c in next loop, ch 4, s c in next loop, ch 4, s c in next d c, ch 3, s c in next d c, repeat from * 6 times, ch 4, s c in next loop, ch 4, 2 d c in next loop, ch 4, s c in next loop, ch 4, join. 12th Round- Sl st into loop, ch 3, d c in same space, * ch 3, s, c in next loop, ch 5, skip l loop, s c in next dc, ch 3, s c in next d c, ch 5, skip 1 loop, s c in next loop, ch 3, 2 d c in next loop, repeat from * all around ending to correspond, join in 3rd st of ch. 13th Round- Ch 3, s c in next d c, * ch 8, skip 2 loops, 2 d c in next loop, ch 8, skip next 2 loops, s c in next d c, ch 3, s c in next d c, repeat from * all around ending to correspond, join. 14th Round- Sl st into loop, ch 3, d c in same space, * ch 4, s c in next loop, ch 4, s c in next d c, ch 3, s c in next d c, ch 4, s c in next loop, ch 4, 2 d c in next loop, repeat from * all around ending to correspond, join. 15th Round- Ch 3, s c in next d c, * ch 5, skip 1 loop, s c in next loop, ch 3, 2 d c in next loop, ch 3, s c in next loop, ch 5, skip 1 loop, s c in next d c, ch 3, s c in next d c, repeat from * all around ending to correspond, join. 16th Round- Sl st into loop, ch 3, d c in same space, * ch 9, skip 2 loops, s c in next d c, ch 3, s c in next d c, ch 9, skip 2 loops, 2 d c in next loop, repeat from * all around ending to correspond, join. 17th Round- Ch 3, sc in next d c, * ch 5, s c in next loop, ch 5, 2 d c in next loop, ch 5, s c in next loop, ch 5, s c in next d c, ch 3, s c in next d c, repeat from * all around ending to correspond, join. 18th Round- Sl st into loop, ch 3, d c in same space, * ch 4, s c in next loop, ch 6, skip 1 loop, s c in next d c, ch 3, s c in next d c, ch 6, skip 1 loop, s c in next loop, ch 4, 2 d c in next loop, repeat from * all around, ending to correspond, join. 19th Round- Ch 3, s c in next d c, * ch 9, skip 2 loops, 2 d c in next loop, ch 9, skip 2 loops, s c in next d c, ch 3, s c in next d c, repeat from * all around ending to correspond, join. 20th Round- Sl st into loop, ch 3, d c in same space, * ch 5, s c in next loop, ch 5, s c in next d c, ch 3, s c in next d c, ch 5, s c in next loop, ch 5, 2 d c in next loop, repeat from * all around ending to correspond, join. 21st Round-Ch 3, s c in next d c, * ch 6, skip 1 loop, s c in next loop, ch 4, 2 d c in next loop, ch 4, s c in next loop, ch 6, skip 1 loop, s c in next d c, ch 3, s c in next d c, repeat from * all around ending to correspond, join. 22nd Round- Same as 16th round. 23rd Round- Ch 4, d c in next d c, ** ch 1, skip 1 st of ch of next loop, d c in next st, * ch 1, skip next st of same loop, d c in next st, repeat from * twice, ch 1, 2 d c with ch 1 between in next loop, ch 1, skip 1 st of ch of next loop, d c in next st, * ch 1, skip 1 st of same loop, d c in next st, repeat from * twice, ch 1, d c in next d c, ch 1, d c in next d c, repeat from ** all around ending to correspond, join in 3rd st of ch. 24th Round- Start Brim: * Ch 3, s c in next st, ch 3, skip 3 sts, s c in next st, repeat from * all around (76 loops), join. 25th Round- Sl st into loop, ch 3, d c in same space, * ch 4, skip 1 loop, 2 d c in next loop, repeat from all around, ch 4, join in 3rd st of ch. 26th Round- Ch 3, s c in next d c, * ch 4, s c in next d c, ch 3, s c in next d c, repeat from * all around, ch 4, join. 27th Round- Same as 25th round but ch 5 between d c groups, join in 3rd st of ch. 28th Round- Ch 3, s c in next d c, * ch 5, s c in next d c, ch 3, s c in next d c, repeat from * all around, ch 5, join. Repeat the last 2 rounds once, cut thread. Starch and block.